Yesterday was Easter, and many children probably received baskets of candies and treats from the "Easter Bunny." 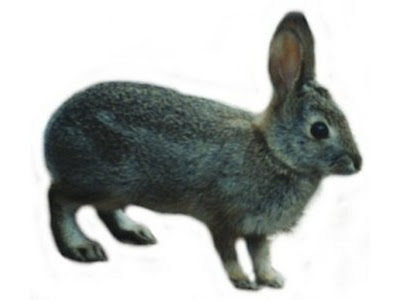 However, when I think of rabbit, I picture it on my dinner plate. I think of its delicious, versatile and nutritious meat but that thought makes some people squirm, those who wouldn't ever eat a rabbit. Why are so many people opposed to eating rabbit, despite the fact it is so tasty, extremely sustainable, and a healthy option? Their main resistance to eating rabbit appears to be primarily psychological. Rabbits are seen as too cute to eat, too much like a pet. Some people may have had a cute, fuzzy bunny as a pet, keeping it in a small hutch, and thus feel squeamish about eating something they once had as a dear pet. These feelings are relative modern and that sentiment wasn't an issue for many prior generations. We need to return to those earlier sentiments as the consumption of rabbit is good on several fronts, as it is the most nutritious and sustainable meats that exists. Rabbits have continued to be eaten as food throughout history, though consumption in the U.S. has apparently declined greatly at least over the last hundred years. Have you ever noticed that it seems almost every movie about the Middle Ages shows rabbit being eaten? Nowdays, Europeans are far more amenable to dining on rabbit and France is the largest producer and consumer of rabbit. My first time eating rabbit was when I was in Spain over 20 years ago. If you're actually concerned about the food you eat, if you want to eat healthier and more sustainable, then you should be eating rabbit. Break through your psychological barrier and try some tasty rabbit. It is good for you, good for society, and good for the environment. (This is a partially modified post from the past which is still very relevant and involves a sentiment which bears repeating). Are you a fan of Carrot Cake? I enjoy carrot cake, though I'm not crazy about the creamed cheese frosting that usually is slathered atop it. I'd like to see more versions of carrot cake that use a different type of frosting. Carrot cake is basically a spice cake that has been flavored with carrots, which provides sweetness to the cake, as well as an element of moisture. It commonly also has chopped nuts in it, and sometimes ingredients like raisins or shredded coconut. According to the World Carrot Museum, the origins of carrot cake extend back to the Middle Ages. As their website states, "It looks like it did evolve from the Carrot Pudding of medieval times, during the middle ages sugar and other sweeteners were difficult or expensive to come by in Britain and carrots had long been used as sugar substitutes." Actual carrot cake extends back to at least the late 18th century. However, creamed cheese frosting didn't unite with carrot cake until the 1960s. What is the first American source to reference carrot cake? According to the Encyclopedia of Jewish Food, by Gil Marks, "The term carrot cake made its first appearance in an American source in The Neighborhood Cook Book by the Council of Jewish Women (Portland, Oregon, 1912), along with a Jewish-style carrot pudding." This appears to be the most authoritative source on this issue, often quoted on other sites discussing the history of carrot cake. However, as my own research has revealed, this source is actually incorrect. The first edition of The Neighborhood Cook Book was published in December, 1912, with a second revised and expanded edition published in 1914. Their original recipe for carrot cake stated, "One-half pound sugar, one-half pound almonds, blanched and chopped, one-half pound carrots, boiled only till they can be grated, juice and grated rind of one lemon, four eggs. Cream the yolks and sugar; whites beaten to snow, added last; add three or four bitter almonds; beat for one half hour before adding whites of eggs. Butter spring form and sprinkle with grated zweibach. Bake in a moderate oven one and one-quarter hours, till loosed from pan." Through my research of some newspaper archives, I found several sources concerning carrot cake that predate the publication of this cookbook in December 1912. First, The Detroit Times, December 19, 1908, had an article about doctors in London living on a diet of carrots, including "carrot cake." This is indicative that American readers were at least familiar with carrot cake, though the article is discussing London. It's fascinating what information you can find in newspaper and magazine archives. 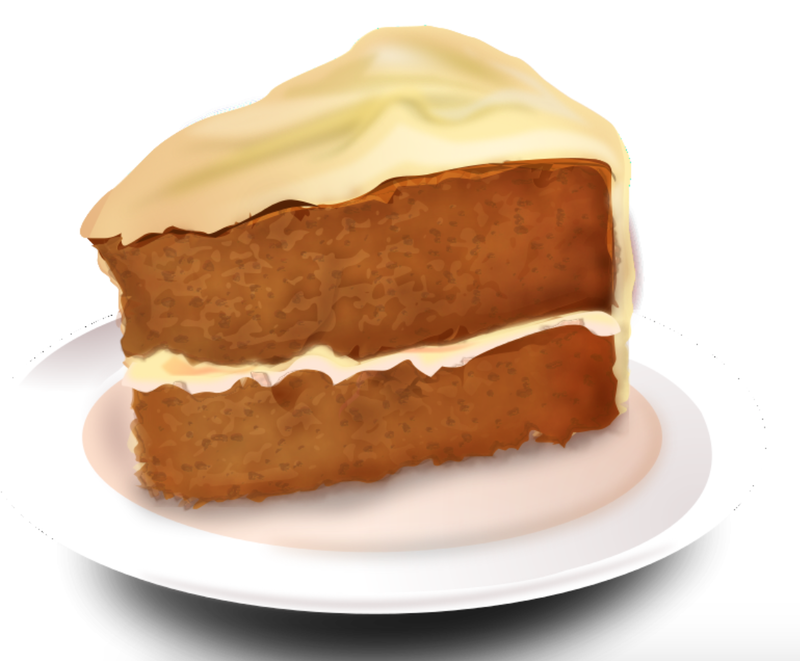 What restaurant or bakery serves your favorite Carrot Cake? 1) Do you like Pinot Noir? Do you like Oregon Pinot Noir? If so, you might want to check out Pinot In The City, which will be held on Thursday, May 2, from 6:30pm-9pm (with VIP access at 5:30pm), at the Castle at Park Plaza. 60 wineries from Oregon’s Willamette Valley will be coming to this event. 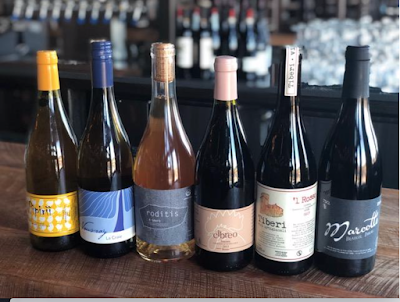 The tasting event features owners and winemakers pouring a selection of wines, including library and current releases, paired with delicious Pinot noir-friendly small bites. Not only will there be Pinot Noir, but there will also be Oregon Chardonnay, Pinot Gris, Riesling, Sparkling Wines and more. Each winery will present about 3 wines so there will be approximately 180 wines available for tasting. I've seen the Tasting Booklet for this event and there are plenty of amazing wines on the list, from some of the best wineries in Oregon. This is an excellent event for the value as well, as you'll be able to taste plenty of higher end wines that you might not usually get to sample. Tickets cost $90 for General Admission & $130 for VIP Admission and can be bought through Eventbrite. Tickets are limited and must be purchased in advance; there will be no ticket sales at the door. 2) Now in its 26th year, the Taste of the North End (ToTNE) will return to DCR’s Steriti Memorial Rink, 561 Commercial Street, on Friday, April 26, from 5pm-10pm. A food festival founded by restaurateur Donato Frattaroli and emceed by radio personality and TV host Billy Costa, the annual event draws upwards of 1,000 attendees who share in celebrating the historic neighborhood’s rich culture while feasting on samples of world-famous Italian cuisine. When we think of the North End, we think of high-priced real estate and a hot restaurant scene. What we may not think of are the hundreds of elderly who have lived and worked there for their whole lives but are now living in poverty and struggling to access the medical/social services they need; we may not think of the North End’s Eliot School having 22 families experiencing homelessness and 38% of students who are food-insecure. Over the past 27 years, the North End neighborhood has changed greatly but for those who struggle, higher prices for goods and real estate doesn't change the reality of their daily lives. The Taste of the North End was founded in 1993 to raise money for local organizations that provide health care and other social services to those who desperately need it. 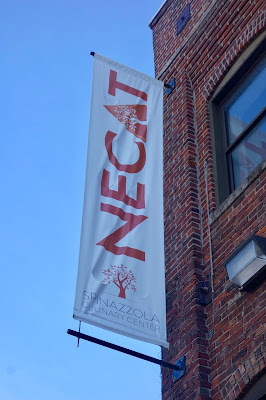 It benefits the North End Waterfront Health Center’s critical medical and social service programs, as well as other local organizations such as: the Eliot School, St. John School, Harvard-Kent School, North End Against Drugs, North End Athletic Association, the North End Music & Performing Arts Center and more. This year’s 2019 “Restauranteur Award” will be presented to longtime Taste of the North End supporters, The Picariello Family, owners of Hanover Street’s iconic bakery, Modern Pastry. Musical entertainment will be provided by local vocalist, Vanessa Salvucci. This event is reserved for guests ages 21+ with proper identification. 3) In honor of Earth Day (Monday, 4/22), Forge & Vine located at The Groton Inn, will feature a special flight of wines highlighting their extensive collection of natural, organic and biodynamic grape varietals from around the world. 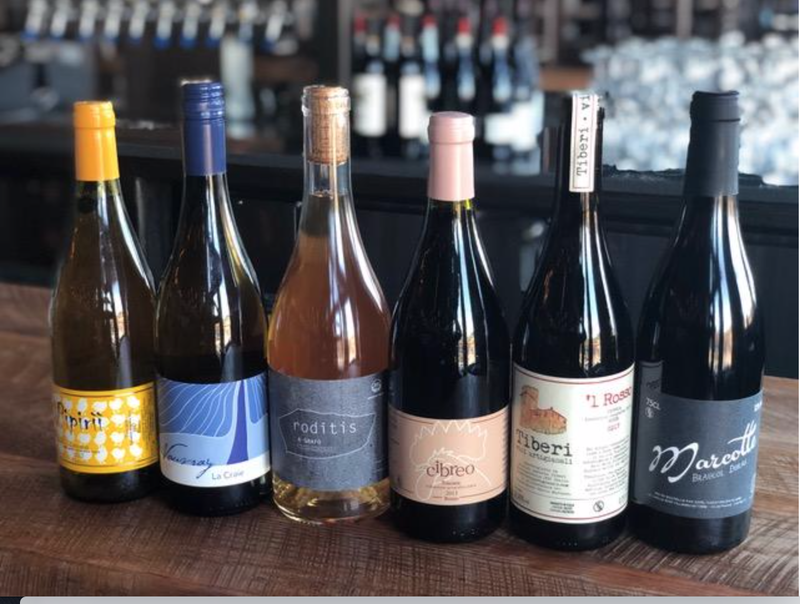 In efforts to better educate and introduce its diners to more earth-friendly wines, the restaurant currently offers a total of 16 natural, bio-dynamic and organic-farmed wines on their menu from Italy, France and the Mediterranean. 4) At The Hawthorne, the finest elements of the craft cocktail movement pair with a heightened focus on hospitality, comfort and geniality. Nationally-recognized as one of the country’s top mixologists and craft tenders, The Hawthorne is the next iteration of Jackson Cannon’s vision and the first in which the bar is truly positioned as the star. The expansive cocktail menu is filled with nouveau classics, rediscovered gems and daily changing creations; throughout, tenders remain ever willing to interpret guests’ desires with on-the-spot concoctions. Swizzle Sundays: Making its grand return to The Hawthorne this summer with a new rotating lineup of all-stars in the industry. Join Bar Manager, Jared Sadoian, and Owner/Bar Director, Jackson Cannon, on the patio for a tiki-inspired cocktail party. Sunday Sips: Back by popular demand, Sunday Sips is featuring a fresh round-up of education and spirits tasting! Gin & Gin Cocktails of The World: Take your drink making to the next level with Bar Manager Jared Sadoian and Head Bartender Rob Ficks as The Hawthorne puts your cocktail skills to the test, focusing in on the wide world of drinks made with one the most versatile cocktail spirits -- GIN. I'm a huge fan of breakfast, and can enjoy it morning, noon and night. In January, a new breakfast spot (though they also serve lunch) opened in Danvers, just off Route 1 and I had to check it out, especially as the menu looked enticing. After several visits, I'm impressed with their food and service, and it's a restaurant that I'll be patronizing on a regular basis. Nick & Andy's is owned by Nick and Andy Moli, Albanian natives, who possess plenty of experience in the restaurant industry and finally decided to open their own. The restaurant is medium-sized, with numerous tables, booths, and a small dining counter. There is a casual vibe to the spot, and it seems to be doing a very good business, being crowded even during the week. I suspect that on the weekends, you might have to wait for a table during the busiest hours. 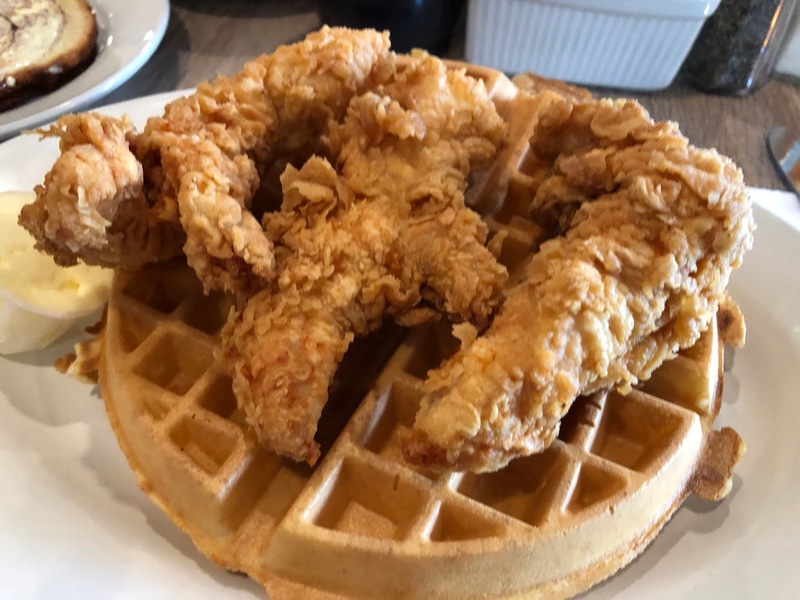 The menu is expansive, with plenty of the usual breakfast dishes, including Eggs any Style, Omelets, Eggs Benedict, Pancakes, Waffles, French Toast, Biscuits & Gravy, and more. Plus, they have some of their own unique dishes, such as the Cinnamon Swirl Slammers ($8.99), two breakfast sandwiches with egg, sausage, & cheese on cinnamon swirl bread. With some of your breakfast dishes, you have an option of meats, the usual bacon, ham or sausage, but there is a fourth option as well, kielbasa. I'm also pleased to see that not only do they serve home fries as a side, but they also have hash browns, which are my personal preference. The Lunch options include Salads, Sandwiches, Clubs, Roll Ups, Grilled Sandwiches, and Entrees, including items like Burgers, Chicken Kabob Roll Up, Tuna Melt, Marinated BBQ Steak Tips, and Fish & Chips. You'll also find some Daily Specials. Prices are reasonable, especially considering the quality and quantity of food, and nearly all of the dishes cost less than $11. You might want to start breakfast with one of their Home Made Muffins ($2.50), which commonly are Blueberry and Corn. 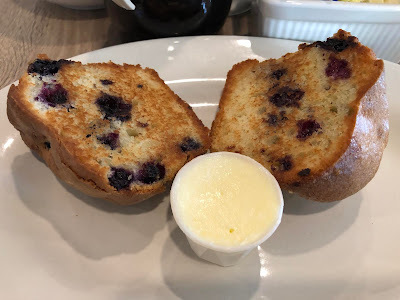 Above is their Blueberry muffin, which has been grilled (one option), and it was quite tasty, obviously homemade, with a good amount of sweet blueberries. They make only a limited amount of muffins each day, so they might not be available late in the day. 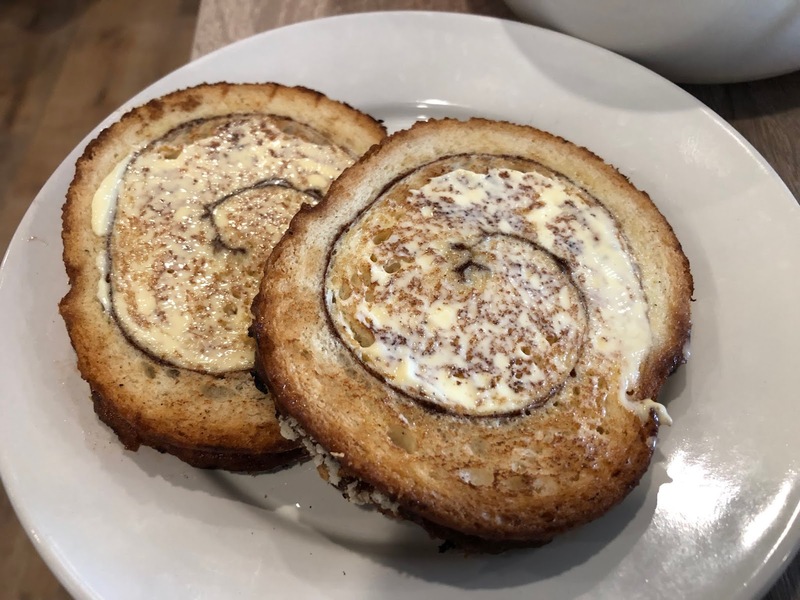 If you are looking for something else a little sweet, maybe you will be tempted by the Vlore Homestyle Cinnamon Swirl Toast ($1.49), which is made by the Vlore Bakery in Missouri. As Nick and Andy Moli lived in Missouri for a time, this is likely where they became enamored with this cinnamon swirl bread. The bread is made with a sweet dough and Korintje cinnamon, and has a nice texture, rich cinnamon flavor, and isn't overly sweet. As I mentioned earlier, this bread is also used to make Cinnamon Swirl Slammers, breakfast sandwiches. 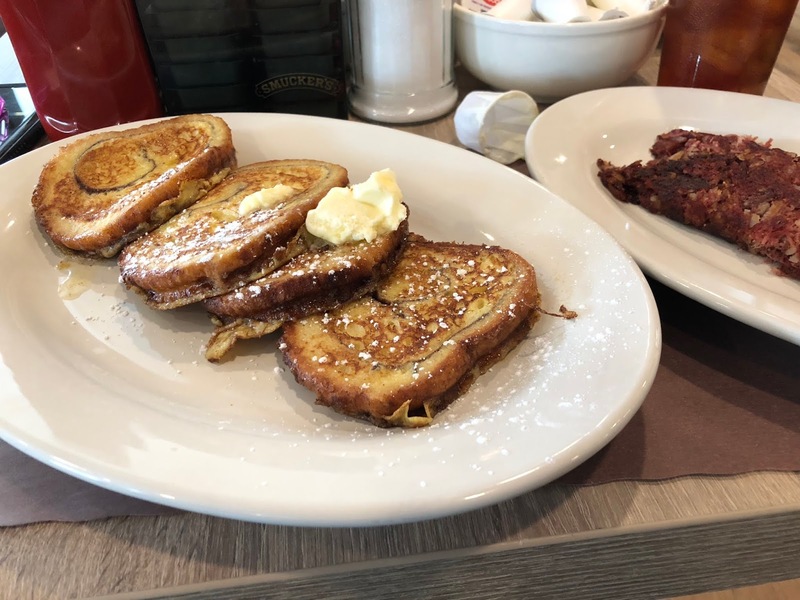 You can also order the Cinnamon Swirl French Toast (Four slices for $5.95), or get it as a Combo ($8.45) with two eggs & two pieces of bacon or sausage. This French Toast is excellent, the cinnamon adding just enough sweetness to the dish without overdoing it. Another excellent dish is the Chicken & Waffle ($10.95), which has three large pieces of fried chicken atop a Belgian waffle. The waffle is good, with a nice crispness to the exterior and it is fluffier inside. The ample portion of chicken has a great crunchy & flavorful coating with moist meat. I've had this dish twice and it was consistently delicious. 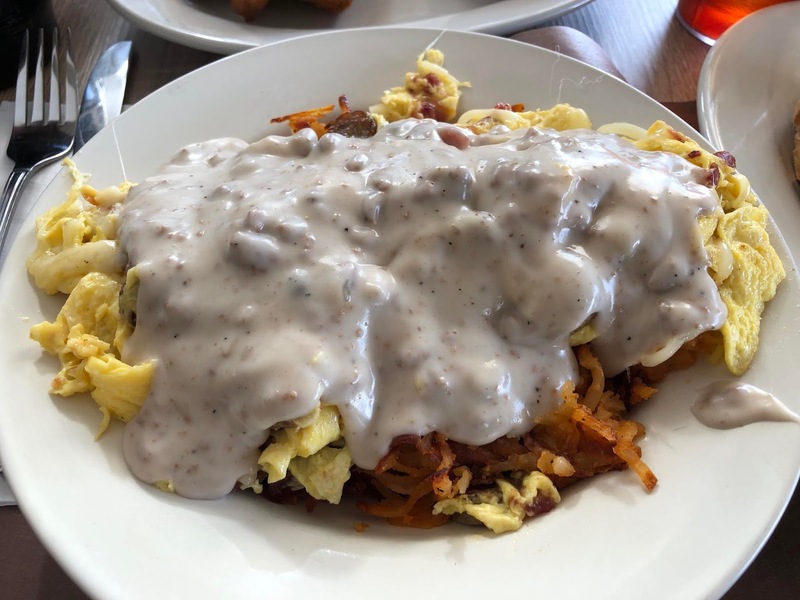 One of their most popular dishes, and which doesn't photograph well because of the color of the gravy, is the Hash Stack ($9.95). Start with a base of hash browns and then top it with bacon, sausage, scrambled eggs, cheese and sausage gravy. Yes, it may not be the healthiest of dishes but it will well satisfy your belly. The gravy actually isn't heavy, and has a compelling taste, complementing the rest of the ingredients. There is a nice blend of textures and flavors, and it's easy to understand why this dish is so popular. It is accompanied by your choice of toast as well. Pure comfort food! 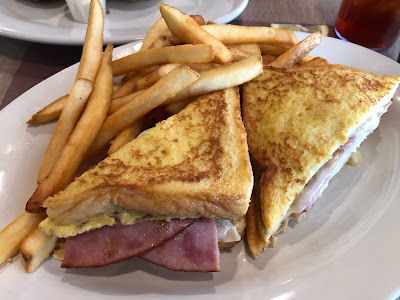 Of their lunch choices, I had to try their Monte Cristo ($8.50), as it is one of my favorite sandwiches. It includes Ham, Turkey and Swiss Cheese on French Toast, with a side of fries or cole slaw. There was plenty of meat and cheese inside the sandwich, and the french toast was a great vehicle for the fillings. Overall, there was a nice taste to each bite, with the Swiss taking a slightly dominant role. It is definitely one of the better Monte Cristo sandwiches I've tasted. 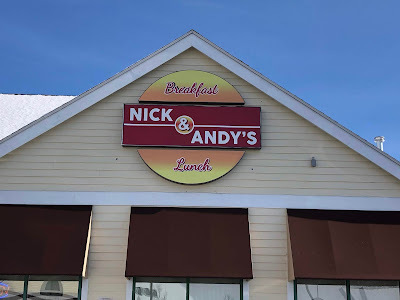 Nick & Andy's gets my hearty recommendation, especially as a breakfast destination. Service is very good, and I had only a single, minor service incident over the course of four visits, which was quickly addressed and resolved. Excellent food, reasonably priced, which will satisfy your breakfast urges. I'm already thinking about what to order the next time I dine there.